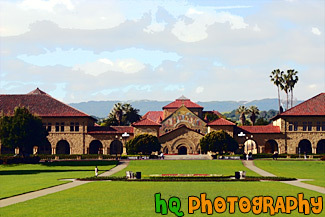 A scenic picture taken of Stanford University on a beautiful sunny day with blue sky and palm trees. This photo was taken at the Memorial Court buildings which is near the "Oval." 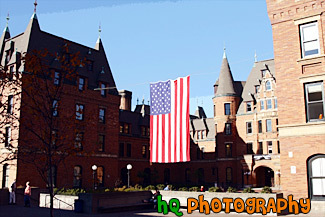 A scenic picture taken of the famous Stadium High School building on a beautiful sunny day. Stadium High School is located in downtown Tacoma, Washington and has an amazing view of the Puget Sound waters. 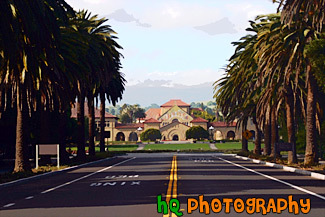 A scenic picture taken of Stanford University from Palm Drive looking at the "Oval" and "Stanford Mall." The building in the distance is Stanford Memorial Church which is located at the center of the campus. Palm Drive is a mile-long, palm tree-lined entrance to the Stanford campus. It connects Stanford with the neighboring town of Palo Alto. 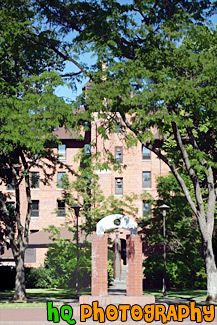 Bike and walking paths and an arboretum border Palm Drive, and the street culminates at the Oval, a lawn at the front of campus where students often study or play volleyball and Frisbee. 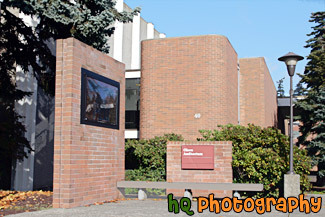 A scenic close up picture taken of the back side of the Harstad Residence Hall located on the campus of Pacific Lutheran University in Tacoma, Washington. 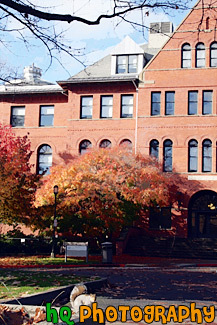 Pacific Lutheran University offers more than 3600 students a unique blend of academically rigorous liberal arts and professional programs. 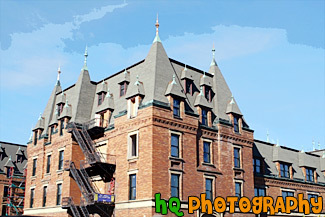 A close up scenic picture taken of the historic Stadium High School on a sunny blue sky day. 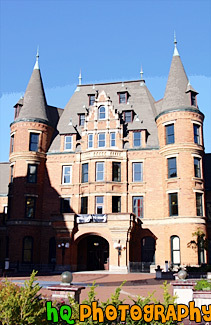 Stadium High School is located in downtown Tacoma, Washington and is an 100 year old high school. The building was originally intended by its financiers, the Northern Pacific Railroad Company and Tacoma Land Company, to be one of the finest luxury hotels on the Pacific Coast. Over the years, Stadium students have created and installed stained glass windows, metal sculptures, ceramic mosaics and other works of art, enhancing the beauty of the building. Since 1977, Stadium has been listed in the National Register of Historic Places. Its exterior was used in the 1999 movie 10 Things I Hate About You. 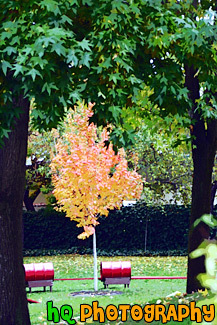 A scenic vertical picture taken of a red brick building and a squirrel in the forground on a fall day at the University of Washington. A scenic picture taken on campus of a red brick building with ivy growing on it located at the University of Puget Sound in Tacoma, Washington. This photo was taken at a nursery school in California. 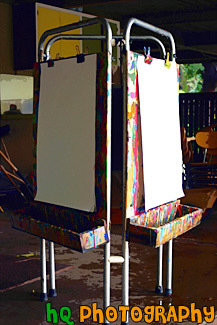 It is a picture what the children use to paint their pictures on during art time. A close up picture taken of the Stanford Memorial Church located on the Stanford University Campus. Stanford Memorial Church stands at the center of the campus, and was one of the earliest and is still among the most prominent interdenominational churches in the West. Memorial Church is open to all religions and is non-denominational. 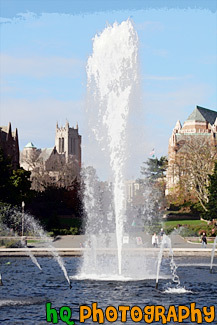 A scenic vertical picture taken of the Drumheller Fountain located on campus at the University of Washington in Seattle. This picture was taken on on a beautiful autumn day with blue sky seen above. 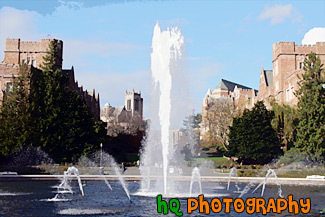 A scenic picture taken of Drumheller Fountain located on campus at the University of Washington. Seen in the background are university buildings located on campus. Drumheller Fountain, in the center of Frosh Pond, was a gift from Regent Joseph Drumheller for the university's centennial celebration in 1961. 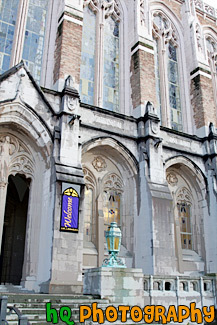 A close up scenic picture taken of the Eastvold Chapel and three lights before the doors located on campus at PLU in Tacoma, Washington. A scenic vertical picture taken of the Eastvold Chapel located on campus at Pacific Lutheran University in Tacoma, Washington. This photo was taken on a sunny, blue sky fall day. 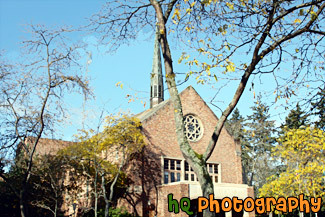 A scenic picture of Eastvold Chapel located on the campus at Pacific Lutheran University in Tacoma, Washington. This photo was taken in early fall as the tree's leaves are starting to change color. This photo was taken on a sunny day. A scenic vertical picture taken of the Eastvold Chapel through trees. 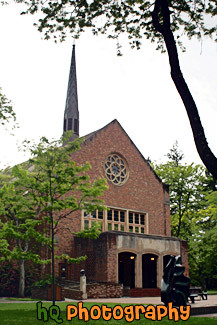 The Eastvold Chapel is located on campus at Pacific Lutheran University in Tacoma, Washington. This photo was taken on an autumn day. A scenic vertical picture taken of Eastvold Chapel which is located on campus at Pacific Lutheran University in Tacoma, Washington. Blue sky is seen in the background on this autumn day. 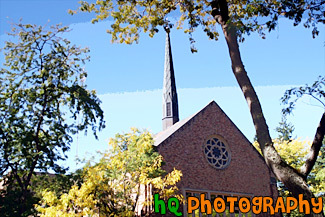 A scenic picture taken of Eastvold Chapel located on campus at Pacific Lutheran University on a blue sky, sunny fall day. 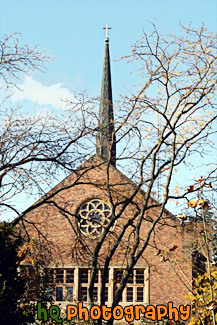 A scenic picture taken of the Eastvold Chapel located on campus at Pacific Lutheran University in Tacoma, Washington. This photo was taken on a cloudy day during late spring season with green trees surrounding the chapel. 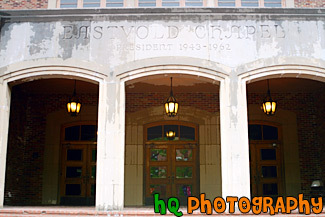 A close up picture taken of the Eastvold Chapel located on campus at Pacific Lutheran University in Tacoma, Washington. 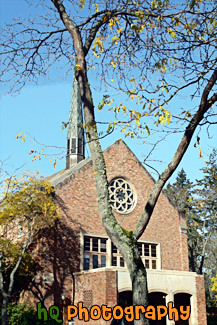 A scenic picture taken of the Eastvold Chapel during the autumn season which is located on campus at Pacific Lutheran University in Tacoma, Washington. This photo was taken on a blue sky sunny day. 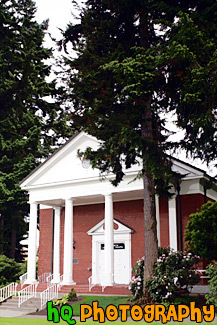 A vertical picture taken of Eastvold Chapel located on the PLU campus in Tacoma, Washington. This photo was taken on a sunny day in early Fall as you can see the colors of the trees start to change color. 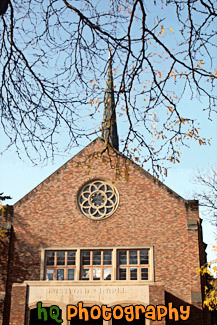 A scenic picture taken of Eastvold Chapel located on campus at PLU in Tacoma, Washington. This picture was taken in late spring as all of the trees are bright green and filled with leaves. A scenic vertical picture taken of Eastvold Chapel with pretty flowers in the foreground and a flag located next to the chapel. 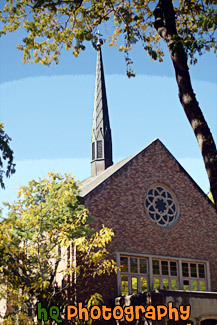 Eastvold Chapel is located on campus at Pacific Lutheran Unviersity in Tacoma, Washington. A close up vertical picture taken of the front entrance to the University of Washington campus library. 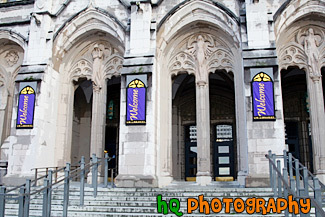 A scenic vertical picture taken of the front entrance to Stadium High School which is located in downtown Tacoma, Washington. This picture was taken on a sunny day seen with blue sky in the background. 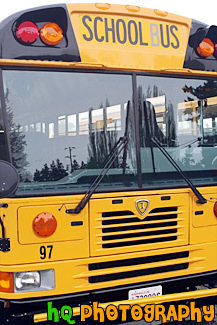 A close up picture taken of the front of a yellow school bus. The school bus number is 97. 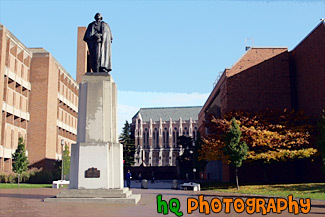 A scenic picture taken of the George Washington statue and the Suzzallo Library seen in the background on campus at the University of Washington in Washington State. Blue sky is seen above. 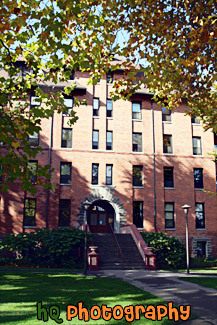 A scenic close up picture taken of the Harstad Residence Hall located on the campus of Pacific Lutheran University in Tacoma, Washington. Pacific Lutheran University offers more than 3600 students a unique blend of academically rigorous liberal arts and professional programs. A scenic picture taken of Hoover Tower at dusk. 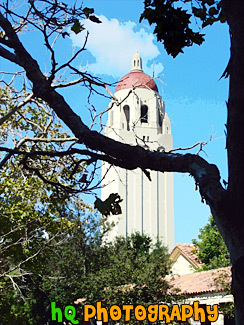 Hoover Tower is located on campus at Stanford University in California. 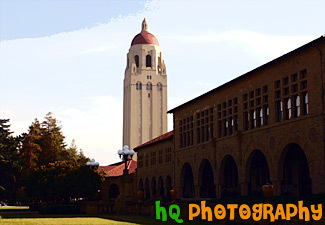 It serves as a landmark of Stanford to faculty, students, alumni and the local community. It was completed in 1941 to celebrate the university's 50th anniversary. It is a 285-foot structure offering superb views of Stanford and the Bay Area from its observation deck. Atop Hoover Tower is a carillon of 48 bells cast in Belgium. The largest bell is inscribed, "For Peace Alone Do I Ring." 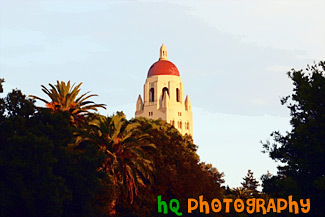 A scenic picture of Hoover Tower taken from the oval at Stanford University. The Hoover Institution on War, Revolution and Peace, is a public policy research center devoted to advanced study of politics, economics, and political economy both domestic and foreign as well as international affairs. By collecting knowledge, generating ideas, and disseminating both, the Institution seeks to secure and safeguard peace, improve the human condition, and limit government intrusion into the lives of individuals. 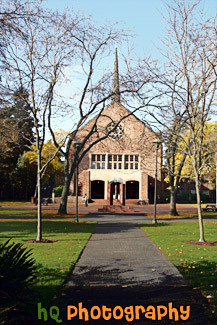 A scenic picture taken of the Kilworth Chapel located on campus at the University of Puget Sound in Tacoma, Washington. William W. Kilworth Memorial Chapel was designed in the classic New England style and commemorates the University's Methodist heritage. 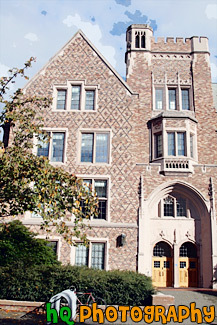 A scenic vertical picture taken of part of the Mary Gates Hall located on campus at the University of Washington. 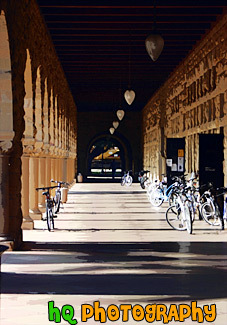 A scenic picture of a walkway outside one of the buildings at Stanford University. 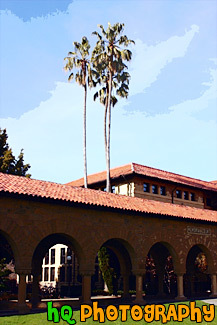 Stanford is located near Palo Alto, California and has a very reputable college program. 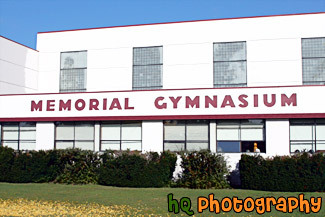 A scenic picture taken of the Memorial Gymnasium located on campus at Pacific Lutheran University on a sunny autumn day. 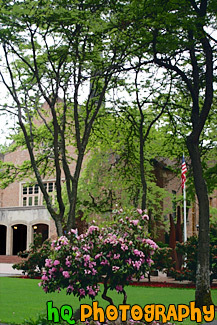 A scenic picture taken of the Olson Auditorium located on campus at Pacific Lutheran University in Tacoma, Washington. 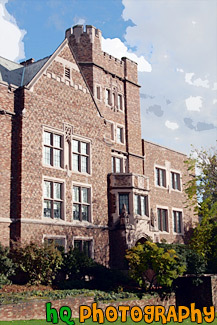 Olson Auditorium is where many sporting events are played. 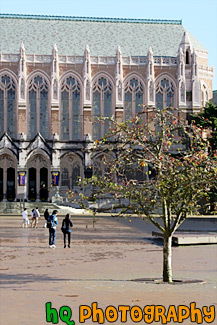 A scenic picture taken of three pillars with signs on them outside of the University of Washington Library. 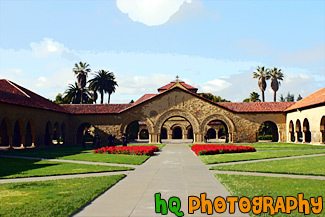 A scenic picture taken at the "Oval" at Stanford University in Palo Alto, California. The Oval is located down Palm Drive on the Stanford University campus. In this picture you can see the Stanford Memorial Church as well as the scenic green hills of Palo Alto behind the buildings in the distance. 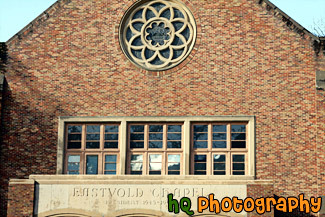 A vertical picture taken close up of the Eastvold Chapel located on campus at Pacific Lutheran University in Tacoma, Washington. 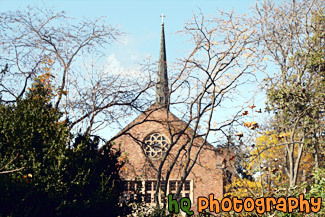 This photo was taken during the fall season as the trees are losing their leaves surrounding the chapel. Blue sky is seen above the chapel. 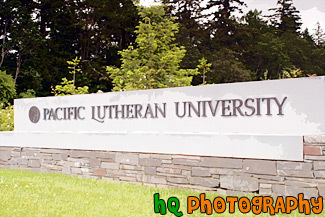 A close up picture taken of a Pacific Lutheran University sign located on campus at the Tacoma, Washington college. 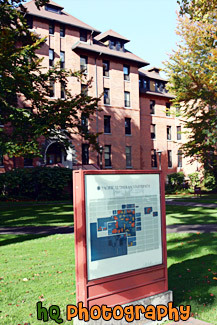 A scenic picture taken of a Pacific Lutheran University sign located out front of Harstad Residence Hall on campus at PLU. 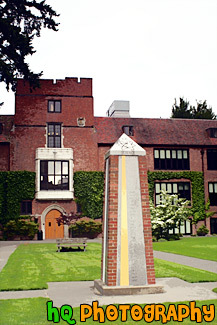 Pacific Lutheran University is located in Tacoma, Washington. A scenic vertical picture taken of a portion of Mary Gates Hall located on campus at the University of Washington in Seattle. This is a scenic photo taken of the children play field taken at a nursery school in California. In the photo you can see the barrels in the distance that children are able to climb in and out of. This play field is enclosed by a fence so the children are able to wander without worry. 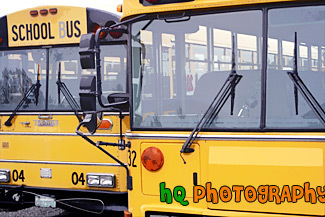 A close up picture taken of the front of two yellow school buses. 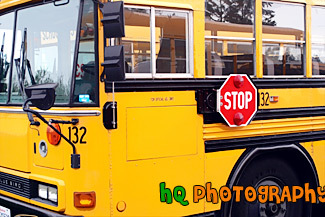 A close up picture taken of the front side of a yellow school bus. The number of this school bus is 132. 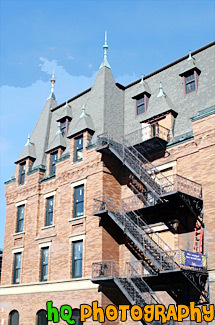 A scenic vertical picture taken of the historic Stadium High School on a sunny blue sky day. 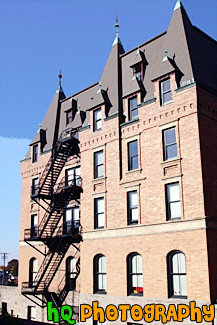 Stadium High School is located in downtown Tacoma, Washington. The building was originally intended by its financiers, the Northern Pacific Railroad Company and Tacoma Land Company, to be one of the finest luxury hotels on the Pacific Coast. Over the years, Stadium students have created and installed stained glass windows, metal sculptures, ceramic mosaics and other works of art, enhancing the beauty of the building. Since 1977, Stadium has been listed in the National Register of Historic Places. 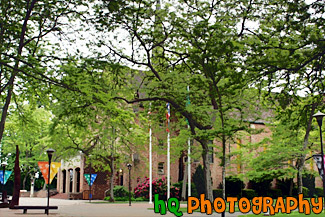 A scenic picture taken of the front entrance to Stadium High School which is located in Tacoma, Washington. This picture was taken on a sunny day. 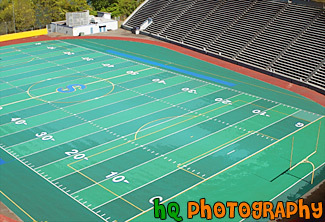 A scenic picture looking down at Stadium High School's football field. This football field has a view of the Tacoma Puget Sound. 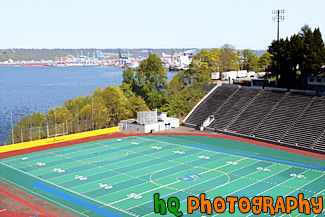 A scenic picture taken of the Stadium High School football field and the Commencement Bay located in downtown Tacoma, Washington. 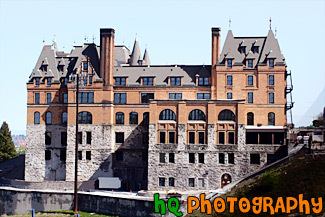 A scenic picture taken of the side of part of Stadium High School which is located in Tacoma, Washington. This picture was taken on a sunny day with blue sky seen in the background. 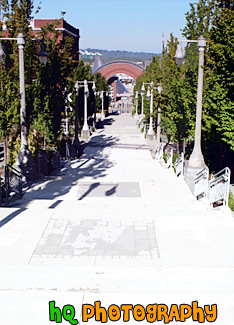 A scenic picture looking down at the stairs of UW Tacoma which is located in downtown Tacoma, Washington. The University of Washington, Tacoma educates diverse learners and transforms communities by expanding the boundaries of knowledge and discovery. UW Tacoma provides a world-class education for students pursuing bachelor's and master's degrees. 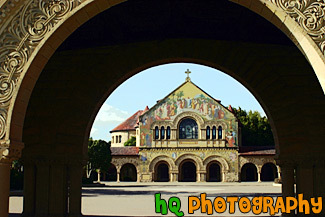 A scenic picture taken of Stanford Memorial Church looking through an arch on the campus of Stanford University. Stanford Memorial Church stands at the center of the campus, and was one of the earliest and is still among the most prominent interdenominational churches in the West. Memorial Church is open to all religions and is non-denominational. A scenic picture taken of the "S" arranged by white and red flowers at the Oval of Stanford University. In the background you can also see Stanford's Memorial Court and Memorial Church. Bordering Palo Alto and Silicon Valley, Stanford is less than one hour from San Francisco, redwood forests and the beaches along the Pacific Ocean. A scenic picture taken at Stanford Memorial Court near the Oval, Stanford Quad, and Stanford Memorial Church. Bordering Palo Alto and Silicon Valley, Stanford is less than one hour from San Francisco, redwood forests and the beaches along the Pacific Ocean. 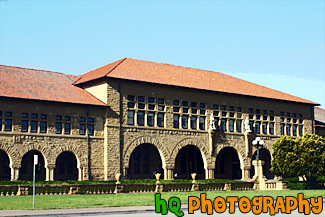 A scenic picture taken of a building located on the campus of Stanford University by the Oval. Stanford University is a unveristy located in northern California (the bay area) and is just 30 minutes from San Jose and San Francisco. Stanford is part of the Pac 10 conference and has a number of outstanding athletic teams. 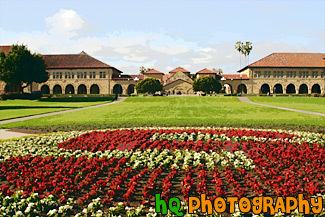 A scenic picture of Stanford University's main entrance taken from the oval. 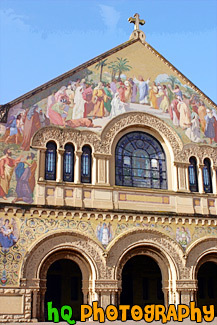 Stanford Memorial Church stands at the center of the campus, and was one of the earliest and is still among the most prominent interdenominational churches in the West. This photo was taken on a sunny blue sky day. The flowers in the front of the photo spell a cardinal "S" for Stanford. 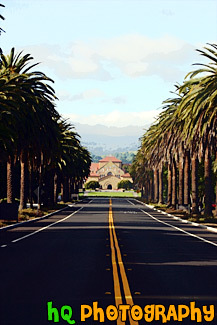 A scenic vertical picture taken of Stanford University's main entrance on Palm Drive. This road is lined with palm trees all the way down to the university heading towards the Memorial Church seen in the background. This is a scenic photo taken on the Stanford campus located near Palo Alto, California with Hoover Tower in the background. 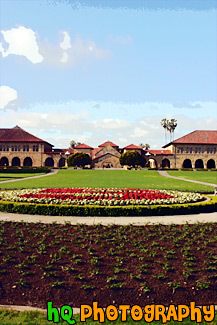 Stanford University is one of the most prestigious colleges around. On October 1, 1891, Stanford University opened its doors after six years of planning and building. Stanford is located on a sheltered area 30 miles south of San Francisco, nestled in the ideal weather zone between the bay and the ocean, its meadows patterned with ancient oaks, Stanford and his wife established their suburban Palo Alto home. Stanford is part of the Pac 10 conference and has reputable sports teams. 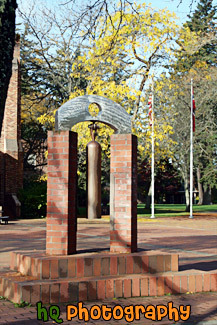 A scenic vertical photo taken of the hanging structure located in the Red Square just in front of Eastvold Chapel at Pacific Lutheran University in Tacoma, Washington. A scenic vertical picture taken of the Suzzallo Library, a fall colored tree, and students walking on campus at the University of Washington on a sunny day. 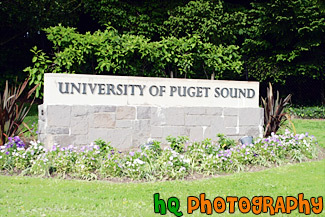 A scenic picture taken of the University of Puget Sound sign located at the entrence to the school. UPS is located in Tacoma, Washington. The university is an independent, predominantly residential, undergraduate college with selected graduate programs building effectively on a liberal arts foundation.